For those familiar with Teochew porridge, Khao Tom is quite similar. 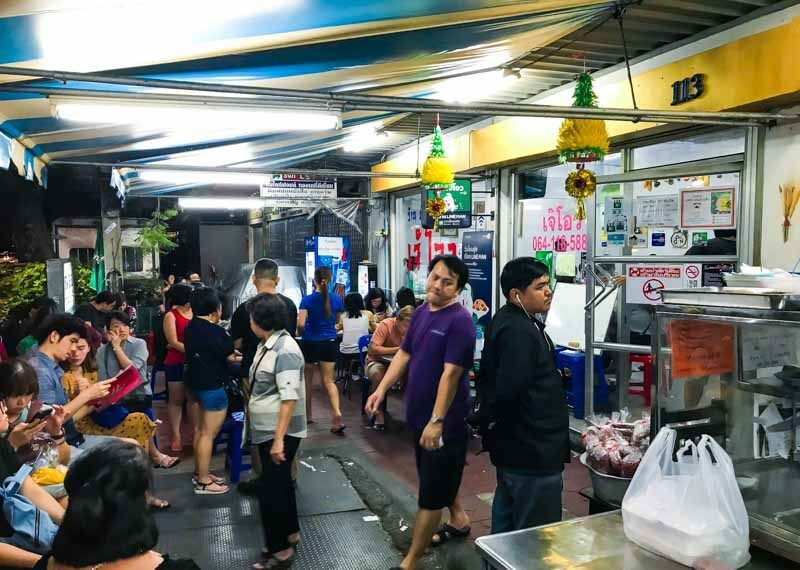 Instead of a smooth puree of rice and water, Khao Tom is basically rice floating in hot rice water and restaurants typically serve it with a huge variety of Thai-Chinese dishes. 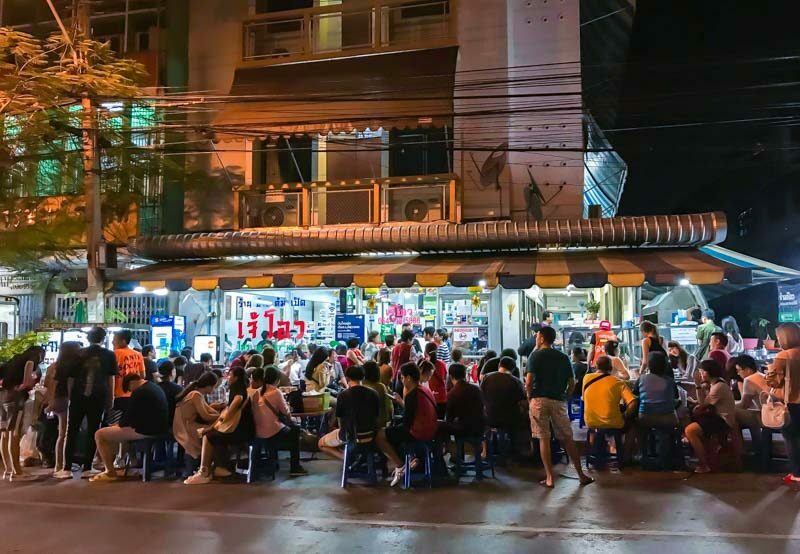 While Jeh O Chula is a Khao Tom restaurant famous for its Khao Tom menu with plenty of loyal customers and celebrities frequenting this place, more recently, Jeh O Chula has been the talk of the town for a whole new dish, the Mama Tom Yum. We felt that we definitely had to go down to check it out! Widely shared on Instagram and Facebook, this dish utilizes the famous Mama brand of instant noodles. It’s only available after 11pm daily as part of a special supper menu. 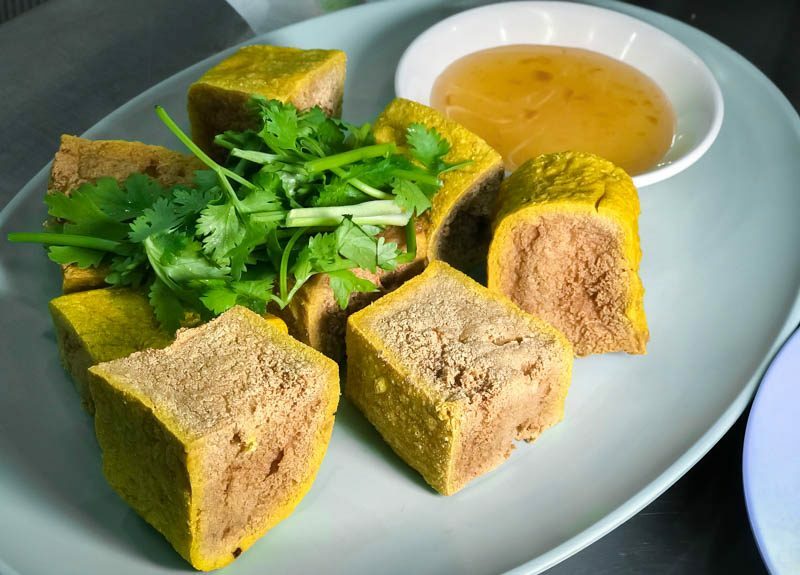 For the first appetizer, we ordered the Deep Fried Tofu (THB40, approx. S$1.70) that was accompanied by a sticky sweet plum sauce. It was slightly different from the typical versions as the outer layer had a crispy yet slightly chewy texture. The next appetizer was the Crispy Shrimp Cake (THB100, approx. S$4.30). 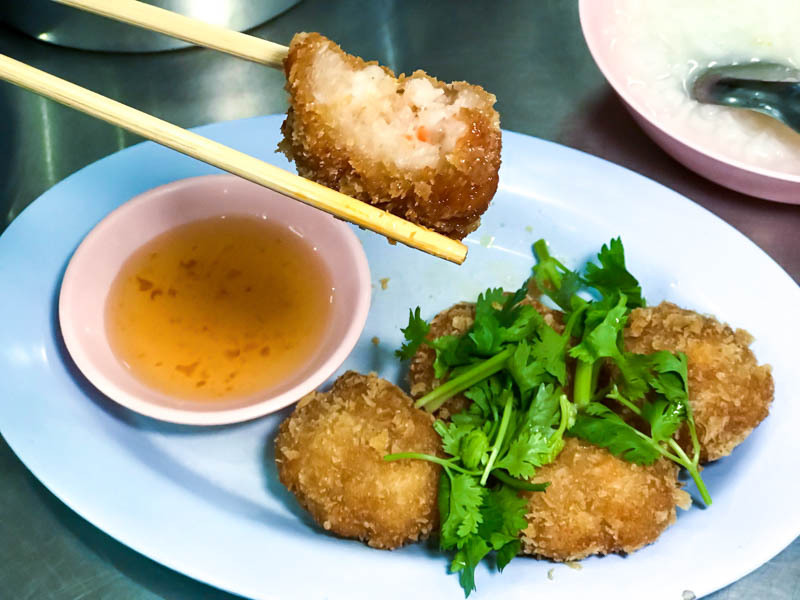 Packed with fresh shrimp and meat, this dish is a must-have for those who like deep fried snacks. The fragrance of this dish made us want more with each bite. Once again, this was served with the sweet plum sauce. We chose two dishes to go with the Khao Tom. The first was the restaurant’s famous Braised Duck (THB100, approx. S$4.20 for small, THB200, approx. S$8.40 for large). It was quite similar to Teochew braised duck, with a faint hint of spices in its gravy. 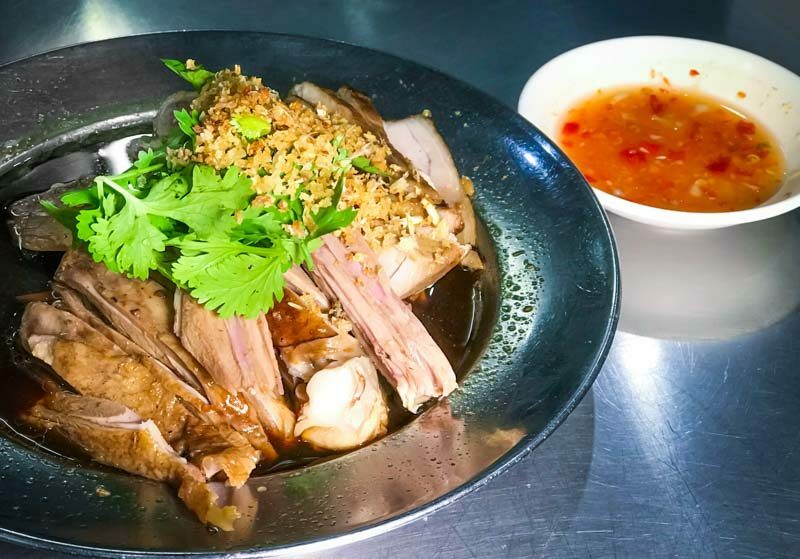 The spices neutralised most of the gamey taste from the duck, and the meat paired perfectly with the sour and spicy sauce that came with the dish. 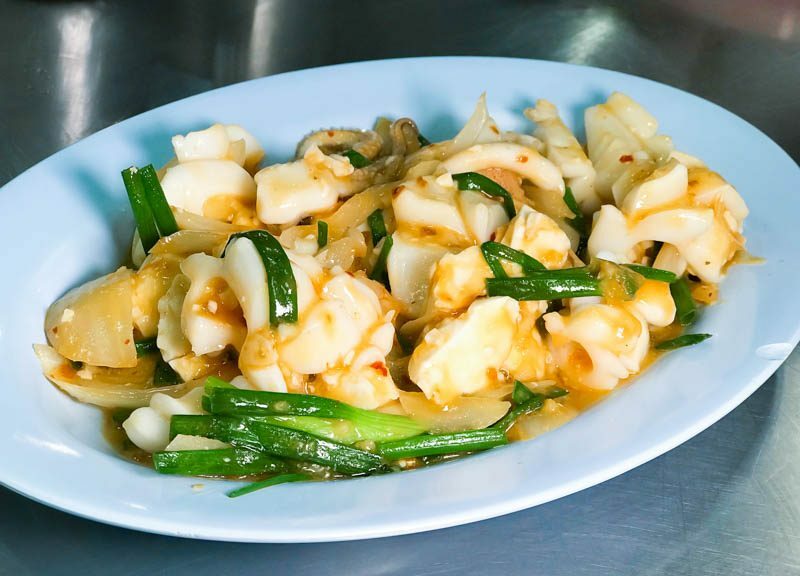 The Stir Fried Squid with Salted Egg (THB100, approx. S$4.20) was served with a starchy, sweet and spicy gravy. The flavours were accentuated by bits of salted egg, but still lacked a bit of the punch that we hoped to get from the dish. As the new star dish of the restaurant, the Mama Tom Yum was something that was on almost every table after 11pm, which was easy to see why. We had the Mama Tom Yum with Pork Meatballs (THB120, approx. S$5.10) and it came piping hot in a large pot. What’s the hype about a bowl of instant noodles, anyway? 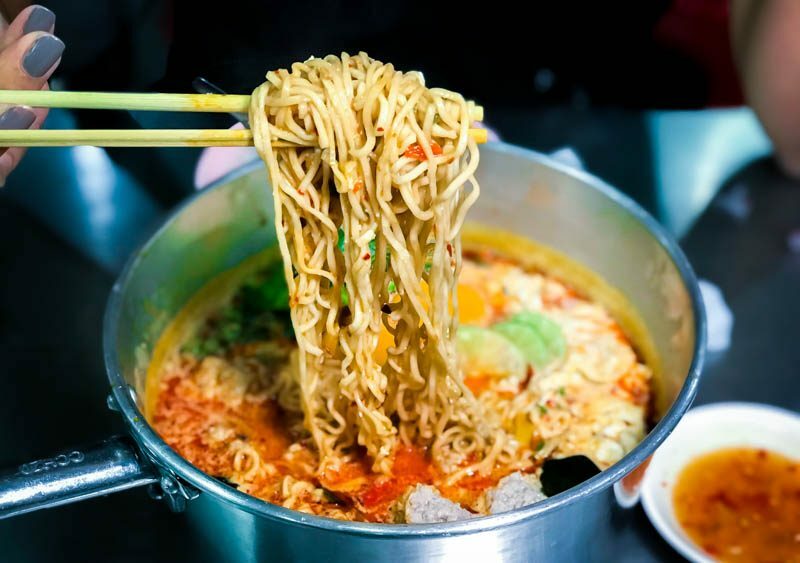 Well, this isn’t your average pot of instant noodles. The soup is enhanced with added chilli, lime, lemongrass and other spices, which made it very flavourful indeed. Customers can opt for various types of ingredients, such as seafood and crispy pork belly, to go with their noodles. Every pot of noodles comes packed to the brim with a whole lot of flavour. Instant noodles can’t get much better than this! 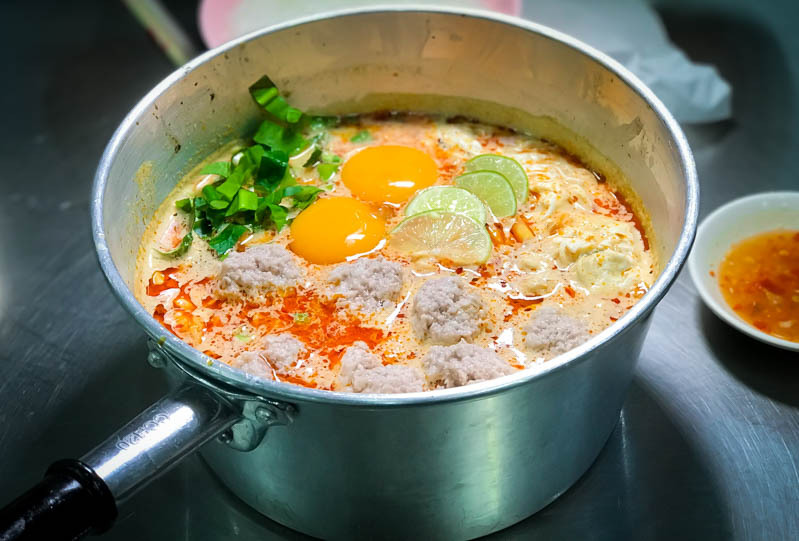 Jeh O Chula is great for those who want to grab a pot of Thai Tom Yum instant noodles for their supper cravings, or for groups that are looking for delicious and affordable Thai dishes to go with their Khao Tom.